Koensan Shiseiin Dairenji Temple has a long history that was built by the venerable Kakuyo in 1544 and it has a legend that it had dedicated a statue of Seishi Bosatsu (Maha-sthama-prapta) carved by Gyoki Bosatsu. Its principle image is Amyda Nyorai, and it belongs to Jodo Shu. It is a branch temple of Shiba Zojoji Temple in Tokyo. The approach to the main gate with beautiful green trees gives visitors comfortable feelings as to forget their ordinal life. 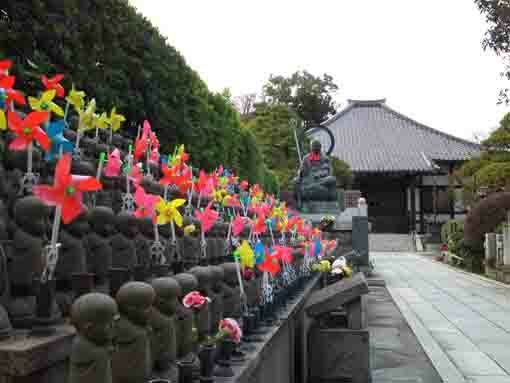 Through the gate, there are hundreds of pretty jizos with hundreds of colorful pinwheels carefully dedicated on the right side of the approach roads to the main hall, and Jizobosatsu (Ksitigarbha) holding a baby on his left hand on the end of the jizos look at them and visitors passing through the gate gently. The back gate called Kuromon was given by Kuroda Family famous for the leading Samurai Worriers, Kanbei and Nagamasa Kuroda, Kuromon Gate was used for the entrance gate of the riding ground of their residence in Edo. 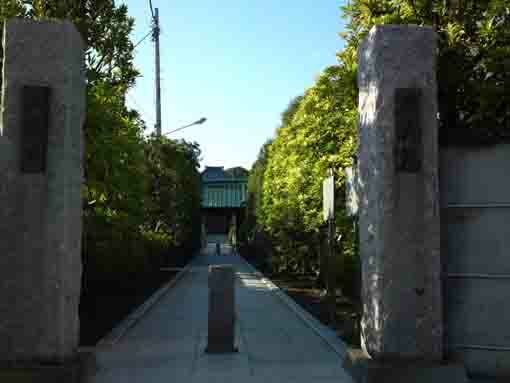 And the monument of honor Ryohei Otsuka and Rokurobei Udagawa's tomb are in the temple, they worked hard to promote the marine products industries of Urayasu. In addition, it is only a temple having the bell tower in Urayasu City. The gardens are well organized. 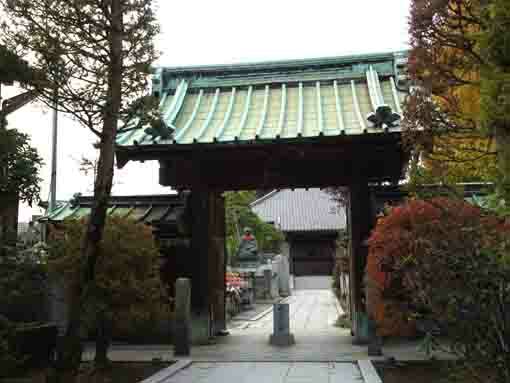 Moreover, Koensan Shiseiin Dairenji Temple is the 33rd temple of the 33 Pilgrimage in Urayasu and Gyotoku. 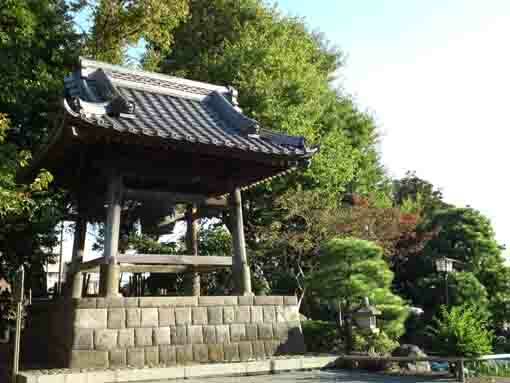 Why don't you visit Koensan Seishiin Dairenji Temple? According to some legends, Koensan Seishiin Dairenji Temple was started as a small temple called Seishiin that had dedicated a statue of Seishi Bosatsu (Mahasthamaprapta) carved by Gyoki in early 700. When he visited Shimousa, he carved a statue of Juichimen Kannon (Eleven Faced Kannon) in Chibadera Temple from a cherry tree, and he carved the Seishi Bosatsu from the same tree. 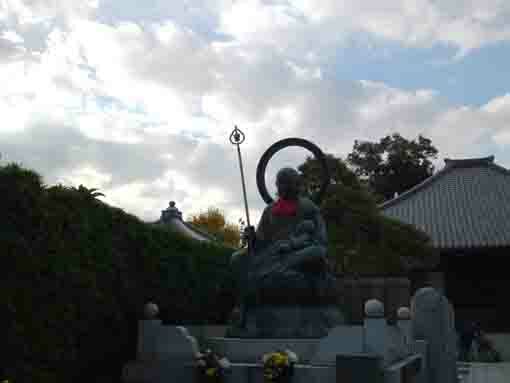 Then he built the Seishiin Temple in Horie in Urayasu to dedicate it. In March 1544, the venerable Kakuyo Sonei, the chief priest of Dairenji Temple in Odawara built Dairenji in Horie since he was deeply impressed when he had seen the sculpture carved by Gyoki. Anyway, the Seishi Bosatsu was lost in a fire in Edo period. The Bell Tower is called 'Shoro' in Japanese, thus it is a building where a bell is struck on. This Bell Tower was built to recall the contribution of the venerable Gakuyo in 1734, Gakuyo became the abbot of Shiba Zojoji Temple in Tokyo. The bell hanged on the tower is used to tell time to farmers working on their fields on busy seasons until May 23rd and on New Year's Eve every year. The bell was casted again in 1877 as it was rusted. But it was donated to the Government in January 1943 since some resources to continue the war in the WWII were insufficient. The bell now in Dairenji Temple was casted by Hidezane and Masahiko Katori in 1951, over 400 supporters of the temple saved 30 yens in each monthly as the fund to recreate the bell. Ryohei Otsuka was born in Horie in 1849. 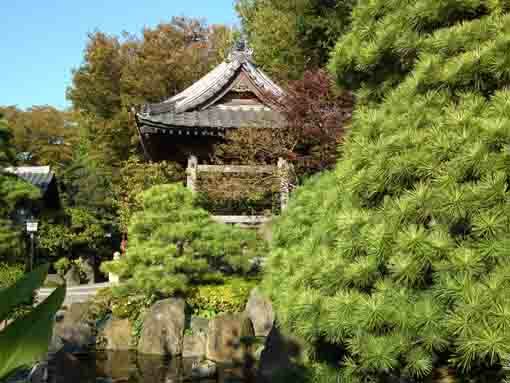 He loved to study haiku poems in his youth and he named 'Shukoan Chogetsu' as his haigo (pen name of haiku poet). One year after the educational system had enforced in 1872, he opened Horie Elementary School as the first elementary school in Urayasu. He worked hard as a school officer, a chief officer at the town office, a director of dike, an officer at the Imperial Household and a keeper of Shinhama Kamoba (Shinhama Imperial Wild Duck Preserve) so he successively held various posts in public offices. He became the leader of the Fishermen's Union, and representative in the advisory committee of the marine products industry in Tokyo Bay since 1884, and he actively worked to promote the industry in Urayasu. To enrich people's lives in Urayasu, Ryohei and some cooperated persons in Kasai and Fukagawa applied for a plan to set a laver culture in Tokyo Bay near Fukagawa to the Government of Tokyo Metropolis. First, few people could understand how this plan would look promising, Ryohei persevered to persuade people and he finally gained the right to use 15% area in the 330,000 square-meter area in Tokyo Bay near Echujima seashore. Later, it would be one of the key industries in Urayasu, but Ryohei could not see it since he had died at age of 41 in 1885. The monument in Koensan Seishiin Dairenji Temple was built for his honor and contribution by the villagers in Urayasu 1892. Rokurobei Udagawa was born in Horie in 1833. He studied at Shoeizaka Gakumonjo (a school directly managed by Edo Bakufu in Yushima, Kanda, Edo), and he opened a school at his house to teach studies and Kendo (training how to use sword). In early Meiji Era, people in Urayasu were in trouble because it had spent much time to check boats passing through the gate house at Nakagawa River (Ojima in Koto-ku) and marine products carried from Urayasu had been spoiled while checking their boats. Then, Rokubei negotiated with the magistrate of the gate, so the boats from Horie could pass through the gate without any checks. Moreover, he solved some struggles with other villages peacefully. In addition, he opened a fish market named 'Maru U' at Nakasu (Hamagashi) to increase the fishermen's income. Therefore, he was deeply trusted and appreciated by the villagers. Rokurobei Udagawa contributed a lot, and in 1893, he passed away at his age 60. Koensan Shiseiin Dairenji Temple has a great accessibility from both Narita and Haneda International Airport.